The Council is a first-in-the-nation, public-private partnership. Businesses pledge to take concrete, measurable steps to eliminate the wage gap in their company. In a city where women make up more than half the residents and half the workforce, pay equity in Boston is not only a moral imperative, it is an economic imperative. That’s what we, the Boston Women's Workforce Council (BWWC), a public-private partnership between Mayor Martin J. Walsh and the Boston business community, aim to do by implementing the 100% Talent Compact, a first-in-the-nation approach to reaching pay equity for working women. To this day, over 250 Boston-area employers have pledged to closing the gender wage gap in our city. As we work to help advance women in the workplace, studying the progress against the national status on women’s advancement is essential to our work. Originated in 1996, the National Committee on Pay Equity (NCPE) created Equal Pay Day as a public awareness event to commemorate the pay inequities between men and women. The event takes place on a Tuesday in April every year to represent how far into the next work week women must work to earn what men earned the previous week. According to a Census Bureau report released last year, women earned 80.5 cents for every dollar men earned in 2017. In other words, The median salaries of all full-time, year-round workers showed women earning $41,977 compared to $52,146 for men in 2017. 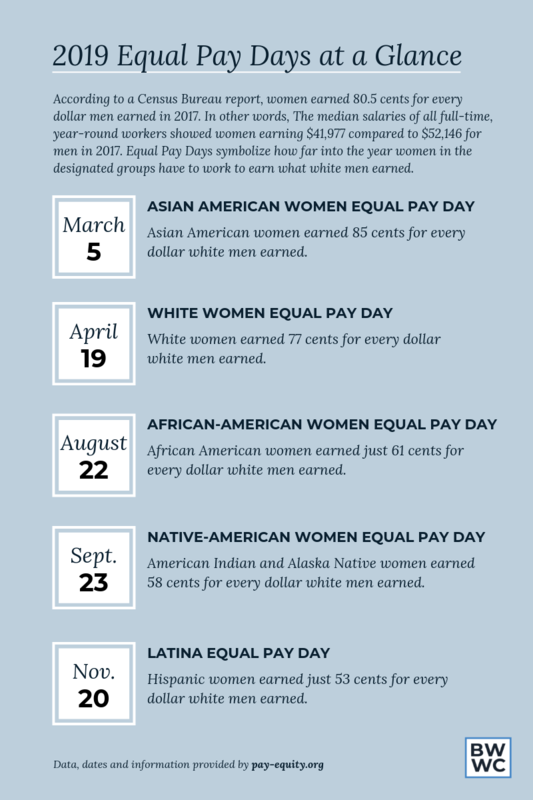 Equal Pay Days symbolize how far into the year women in the designated groups have to work to earn what white men earned. Equal Pay. Equal Opportunity. 100% Talent. The Boston Women's Workforce Council believes that the first step to solving a problem is by measuring it. That's why the BWWC conducts biennial reports on the status of the wage gap in greater Boston and what employers can do to close it. By joining the 100% Talent Compact, employers pledge to anonymously and securely participate in this process. Our reports feature first-of-its-kind wage data from real employers, broken down by race and gender. In September 2017, 114 employers participated in the BWWC’ s second biennial data reporting cycle. These businesses and nonprofits reported data on almost 167,000 employees - roughly 16% of the Greater Boston workforce, representing $15 billion in annual earnings. The data indicated that women, on average, earned 76 cents to a man’s dollar. This gender wage gap varied by job category and race, with women of color earning on average significantly less than White women. Gender is assumed to be self-identifed, but is based on the EEOC’s gender binary options, so does not capture the gender spectrum. To learn more about the wage gap in Boston, you can view the full report here. In partnership with over 250 businesses in the Boston area and the Hariri Institute for Computing at Boston University, we will hold several training sessions throughout the summer to prepare members to create the third biennial data report this September. Wage Gap by Industries: Using EEOC-based industry categories, we will report aggregate data by key industries represented by our Compact Signers. Standard Deviation: In addition to providing average wages based on gender, race/ethnicity categories, EEO-1 job categories, length of service, annual compensation (base salary, overtime, and commission), and performance pay (cash only), we will add standard deviation measures so that employers can also see just how consolidated or spread out pay gap results are. If you’d like to learn more about the data collection process, you can download this PDF. If your business is committed to gender equity and looking to make an impact in the City of Boston, join over 250 businesses pledging to take concrete, measurable steps to eliminate the wage gap in their company and in Boston. To learn more, visit our website to learn more about the Compact. The Mayor’s Office of Women’s Advancement partnered with the American Association of University Women (AAUW) to offer free salary negotiation workshops for women in Boston. Individuals can attend a workshop near them or employers can host a workshop. Just announced: individuals can now attend a workshop online. Visit their website to learn more. We look forward to engaging with you in 2019 as we work to resolve the issues that keep women from progressing in the workplace. We are grateful for the commitment of so many Boston area companies to participating in our wage gap measurement process. Together we will make Boston the best place in the US for working women.